The Ryerson University and Archives has created an exhibit, running June 1 – October 31, looking back at the history of the school. For each month the exhibit is open we will feature in our blog one of the 5 themes of the exhibit: 5 pivotal moments in Ryerson’s history, Student Groups and Clubs, Student Government, Student Housing, and Athletics and Intramurals. For August’s post – we will delve into the history of student government on campus. The Ryerson student union has held many names since the inception of the Ryerson Polytechnical Institute. 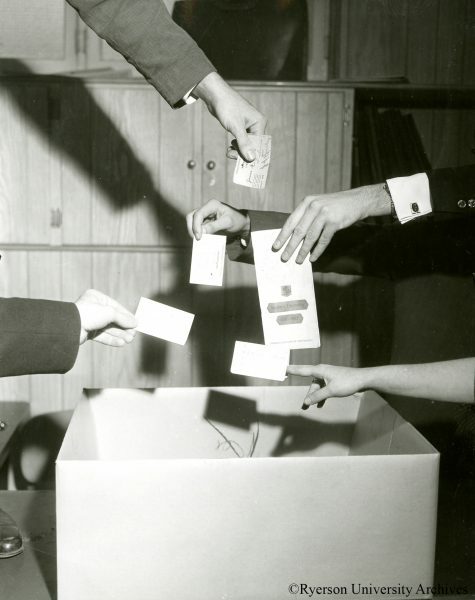 In 1948, the first iteration of the student assocaition was called the Students’ Administrative Council (SAC). In 1970, it changed its name to the Students’ Union of Ryerson Polytechnical Institute (SURPI), and between 1989 and 1996 it was know as Ryerson Students’ Union (RSU). 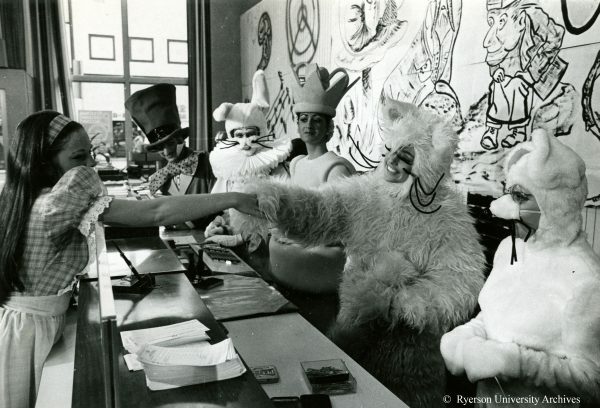 In the mid-1990s, the union was renamed the Ryerson Students’ Administrative Council (RYESAC), and in 2006 it became the Ryerson Students’ Union (RSU) as we know it today. Initially, the student council’s budget was set by the Institute’s administration and the treasurer position was filled by an instructor. At the time, the student union’s main goal was to organize social and extracurricular activities for the student body. 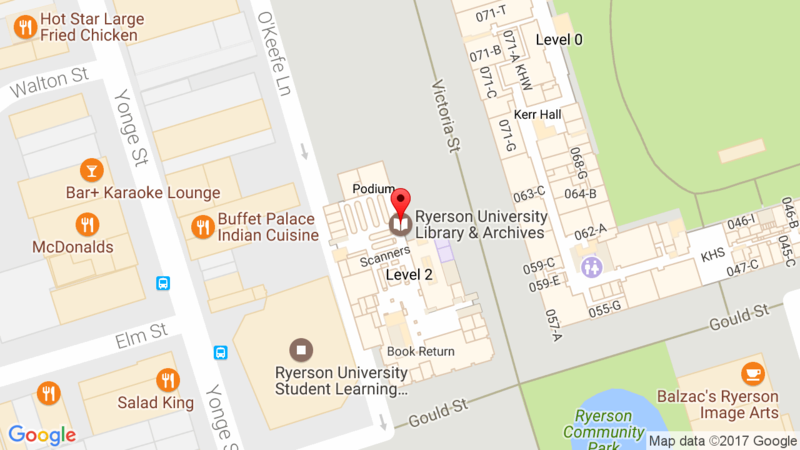 They organized Homecoming Weekend, Open House, the annual student comedy show called RIOT and The Ryerson Opera Workshop (ROW). By the 1960s, the student association evolved into an elected self-governing body which administered its own funds and became a platform for student activism. In 1966, Janet Weir, a secretarial science student became the first woman elected as SAC president. Weir organized a student led protest called “Booxodus” to advocate for a larger book collection in the new library building. 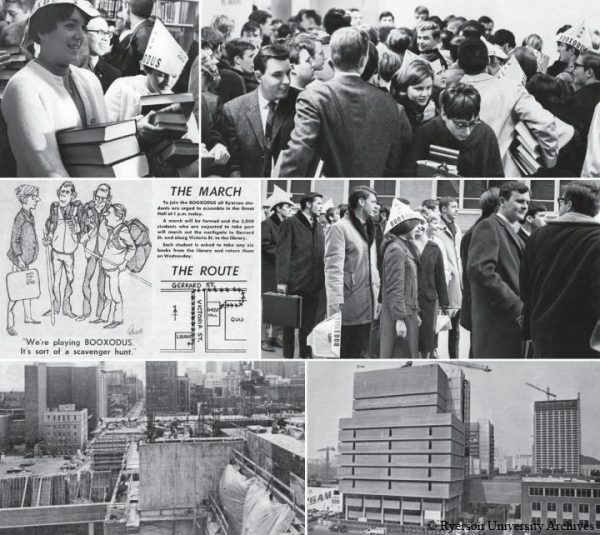 On November 20 1967, students were asked to borrow six books from the library to demonstrate the limited resources available at Ryerson. The protesters borrowed 3,000 books from the library, representing almost a third of the overall holdings. The campaign was successful, and funds were allocated to increase book purchases when the new library would be completed in the 1970s. 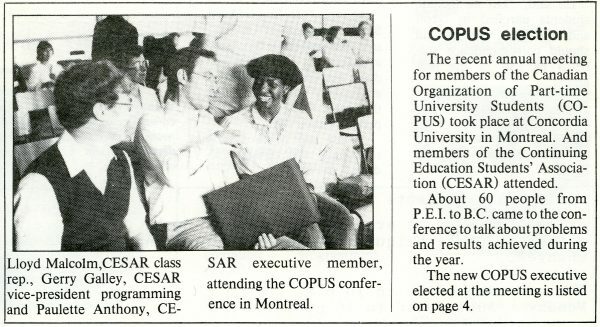 The Continuing Education Students’ Association of Ryerson (CESAR) was founded in 1979 to represent the large proportion of students enrolled in part-time and evening courses. Through the years, CESAR has collaborated with RSU on campaigns such as pedestrianizing Gould Street, eliminating the use of bottled water on campus and stopping tuition hikes. The organization also focuses on issues specific to Continuing Education students, such as daycare service and full financial credit for part-time studies. 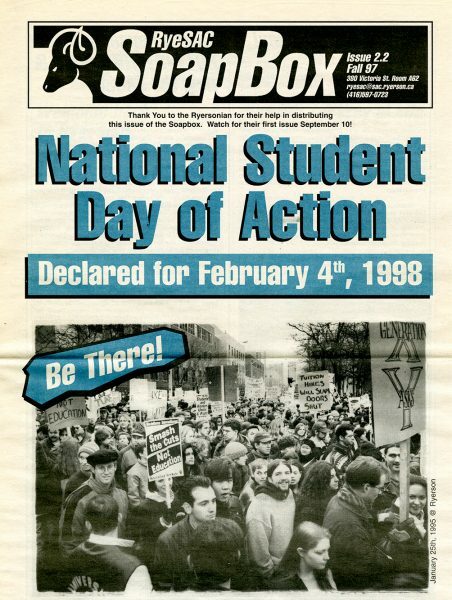 In the early 1990s, the student council lobbied Ryerson to first install recycling bins on campus, and eventually to make them available campus-wide. By the mid-1990s, they organized several student demonstrations in protest of tuition hikes. The president at the time, Victoria Bowman, brought 30 bags of ice to the President’s office as part of a tuition freeze protest. Ryerson’s student government has certainly changed through the years, but it has and will continue to undertake three major roles for the Ryerson community: provide free or affordable services to students, organize social and community-oriented events, and the role of an advocacy group dedicated to improve the condition of students on campus. Stay tuned for next month’s blog when we explore the history of student housing at Ryerson! This entry was posted in Archives, Exhibits and tagged Ryerson 7025 by olivia.wong. Bookmark the permalink.